Introduction: How this came into being, what it is for. Flybacks: What they are, where to get one, what to do with them. Preparing the flyback: How to wind a new primary. Transistors: What you need to know about these solid state switches. The Circuit (Continued): Parts list, how to put it all together and what you can change to make it work for you. Testing and Results: So it's ready... Now what? Includes pictures and videos of the flyback outputting arcs at maximum power and running an ion engine and a cascade. Also includes a short chapter on troubleshooting. Caution! : This is not a toy, and shouldn't be treated as such. Going further: Experiments and devices that can be derived from this. 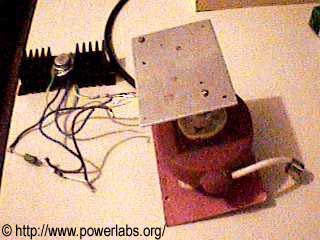 This is by far the best project for someone who is already familiar with High Voltage, but wants to take their experiments to the next level: It requires very little previous experience and skills with soldering and identifying components, and there are virtually no adjustments to be made. The danger is minimal, as fly back transformers are intrinsically low power devices, not capable of outputting lethal currents (due to the hair-thin secondary windings), and yet it will give a careless experimenter a nasty RF burn if he accidentally touches the HV wire (nothing beats learning from your mistakes). If you have never experimented with HV before though, I recommend you start off with an electrostatic project. This circuit is not a toy! It is also by far the simplest source of High voltage at high frequency. The original version of this circuit called for two transistors, and was (as far as I know) derived from a circuit found in: "Build your own working Fiber optic, Infrared, and Laser Space-Age Projects", by Robert E. Iannini, TAB books, 1987, ISBN 0-8306-2724-3. Than Burak modified it to work with a single transistor, which made it EVEN simpler, easier, and cheaper to build... The single transistor version does have it's drawbacks though (discussed in Going Further), as the transistor tends to overheat and die from internal heating very quickly if you are running higher powers... Still, the circuit works and is great for many things, such as drawings arcs, Jacob's ladders, charging capacitors, running a HV cascade (not recommended for beginners! ), powering plasma globes, and even powering a small Tesla Coil! Below you can see the schematic of the circuit: It doesn't get much easier than this! The principle of operation is as simple as the circuit itself: When power is applied, the transistor will conduct the current allowed through resistors R1 and R2 into the flyback primary, causing it to induce a current on the secondary, and, at the same time, on the feedback winding. This feedback current will trigger the transistor to stop conducting, and as the magnetic field in the ferrite core collapses, a large HV spike will appear on the secondary windings (basic inductor action). But now there is no feedback current to keep the transistor off, so it will once again conduct, and the cycle will repeat, at a natural frequency that puts the transformer in resonance, resulting in enormous voltage gain. One of the advantages of having a feedback winding is that the circuit becomes dynamic: The frequency of operation is automatically adjusted to resonance, depending on many factors. It is interesting, because you can actually hear the frequency change as you draw an arc (high loads drop the frequency to a high pitched 20Khz whine which than becomes ultrasonic as the arc grows). The heart of the circuit is a ferrite-cored flyback transformer. There are several different types of flybacks, and any device using a cathode ray tube will contain one (this includes oscilloscopes, televisions, monitors, and others). Most computer monitors and newer televisions use flybacks which have the high voltage rectifier built in. Although a HV rectifier is useful if you want to charge up capacitors or experiment with ion streams, having the rectifier built in is not desired for most high voltage experiments, as it will make the output half wave, and in that way make the output voltage 55% lower than it would be without it. The peak power remains the same, and adding a filter capacitor can correct that problem, but it also requires a resistor to limit the current drawn from the cap during arcing, and it is a pure DC supply, useless for plasma globes and other experiments requiring AC. The CRT on TVs and monitors is also a high voltage capacitor, and you could use it as such in an experimental HV DC power supply (covering the glass with aluminium foil greatly increases the capacitance), but a flat plate plastic cap is much smaller, lighter, and it won't implode if you drop it... Also note that the even newer flybacks out in the market today have the voltage divider and focus control built in. Some don't even have the core visible. These are useless for this circuit. So, overall, flybacks with built in rectifiers are still usable, but you should look for one that has either a removable rectifier (sometimes the rectifier is inside a tube that sticks out from the flyback, other times it is encapsulated in epoxy next to it. Either way, removing it is a good idea if you're able to). The best flybacks come from old TV's or monitors, specially the larger ones, and have a disk shaped secondary. Black and white TV flybacks tend to have a higher internal capacitance and higher step-up ratio, whilst monitor flybacks are pretty much useless, as far as the modern ones are concerned. If your flyback was used in association with a cascade, you can expect to obtain no more than perhaps 12kV from it (with 12V input). However, if it was free-standing, over 30kV may be obtainable (with higher input voltages). Nominal output current is 1-2mA, and arcing current can be as high as 10mA and above (mine can melt a steel sewing needle!). As you can see, it has a rather disk-shaped secondary: This is very important as it usually indicates a large number of secondary turns, and a proportionally high output voltage... The primary coil is wound on a plastic form that sits opposite to the secondary. The rectangular piece of aluminium holds the flyback in place and also serves as a heat sink (as it contains "thermal compound" between it and the ferrite core). The secondary is nearly 10cm (4") in diameter, and 5cm (2") tall, and the core has 1.5cm cross section, and is a square some 10cm on each side. This is by far the best type of flyback to use in high performance circuits. My particular model is a "TDK H1322Q". It has never been used before (I bought the last two an appliance repair shop held as replacement parts. It only cost me 5dollars! ), but is a real antique, and VERY rare to find... If you can get your hands in such a beauty, I'm highly interested. Do not hesitate to e-mail me! The person who sold it to me said it was used in those old black and white valve TVs from the 70's, supposedly a "Phillips" or "Philco" model... I'm not 100% sure, but the last valve TV I took apart had a huge screen, and a very small flyback, so a large old TV is no guarantee of a large flyback. Also note that if you remove your flyback from an old TV it may well have it's secondary winding burned out... Flybacks are built tough, but they are high voltage parts, and as such they tend to have a limited useful life. If it is the primary that is burned out, than it may simply be removed as you will wind a new one either way. Other things to watch out for are the fact that ferrite is very brittle and won't take any bumps without cracking or breaking (and ruining the flyback). Also, the core should have two plastic spacers to form a gap (to prevent the transformer core from saturating at high powers), and these should be returned to place when you close the core. Now wind wind 5 turns of enameled 12 - 18AWG wire (1 - 1.6mm diameter) on the core. Hold it in place with a drop or two of glue, and than wrap a few turns of insulation tape over it to prevent any mishaps (such as the secondary HV wire getting to close to it and injecting thousands of volts into the transistor or the power supply). Than, to make the feedback winding use 22AWG wire (0.64mm diameter) and wind 2-4 turns (depending on your transistor's internal resistance, this needs a bit of tweaking for maximum efficiency to be reached, but 2, 3, and 4 turns will all work and provide stable HV output) then secure it and once again insulate it with tape. NOTE: I noticed that on my flyback, when running extremely high output voltages (in the order of 45kV) corona was forming around the feedback wire. Re-winding it with high voltage insulated (40kVDC) 22AWG wire solved the problem. Something to keep in mind with the larger flybacks..
To your right you can see the schematic symbol of an NPN transistor, and how the pin arrangement translates into real life on a diagram of the transistor. You can also see a picture of the transistor I used mounted on a large heat sink (black). Note how I used plastic spacers to insulate the transistor from the screws that hold it on place, and how there is a mica isolator between the transistor and the heat sink: This is important, as the transistor case may float at high voltage (yup, I've been shocked of that too:) It didn't hurt though, but it just shows you how much feedback is produced by the circuit... Should you accidentally touch the heat sink while you are holding, say, a plasma globe, the transistor would be ruined immediately, unless it was insulated. 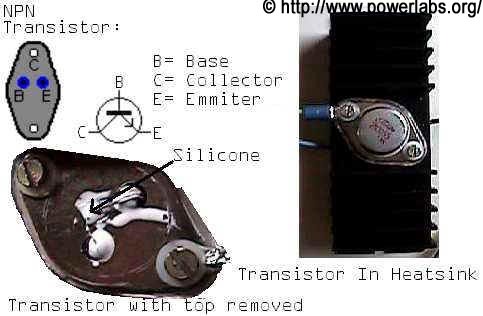 What is important to note on the picture of the transistor with its top removed is that the silicone square (the transistor per se, here covered with some sort of white rubbery glue) is very small... This means that it does not take a lot of power to make it become very hot, very quick, and despite all the thermal mass of the case and heat sink, if you run far too much power through it, the heat just won't be able to dissipate quickly enough and the component will be ruined. Also remember to place thermal compound between the case, the mica isolator, and the heat sink, to ensure maximum heat transfer. The 2N3055 is somewhat under-rated for the high (200W+) powers my flyback can handle. Appropriate substitutions include the MJ2955 or (what I am using now, the largest I could find anywhere), the MJ15003, which is rated for 20A at 140V. The heat sink pictured was substituted for one 3 times as large for the high power work. The value 240 Ohms 1W for R1 is for 12 - 24 volts operation (note: Most flybacks will burn before long if you feed more than 12 volts to them, and even the larger ones may be ruined instantaneously by internal arc over if you go higher than perhaps 30volts... Experiment at your own risk, and be aware that you may well loose your flyback at higher voltages. I normally run mine at 26volts, where it draws 4.5A when shorted (that's nearly 120Watts!!!). For short, high power runs I feed it 36V at which point it draws over 6Amperes, outputting 216watts! It doesn't seem to mind it much after I replaced the feedback wire for HV insulated wire and put epoxy over all connections. At this extremely high power settings, the flyback sprays HEAVILY, and would arc to the core before I had it insulated. I also had to place a drop of epoxy over each secondary tap (since they are not needed, as only the main HV wire and the ground wire are used in experimentation), but I rarely run it at such high voltages, since it is obvious that it was not designed to output that (otherwise it wouldn't have arced), and even though it is possible to extract over 40Kv from it (as I did in the above experiment), secondary breakdown might eventually happen, if not from flashover, than from corona breaking down the insulator that spaces the secondary layers from one another. 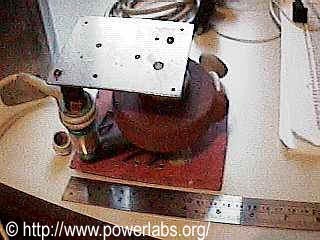 Either way, 240 ohms will operate the circuit at voltages as low as 5V without any problems. As the input voltage rises the power consumption on R2 (27 ohms) increases. Although it seems as though it won't become hot as like R1, current inducted on feedback winding uses R2 to reach the ground and this should be added to the calculation. So check it's temperature and use a higher wattage one if necessary. At 200Watts + I use 5W for R1 and R2... They get warm, but not too much... The transistor, however, gets VERY hot! 1 2N3055 NPN transistor, with complete mounting kit (2 plastic spacers, bolts and nuts to hold it in place, mica insulator, and thermal compound). 1 Large heat sink for the transistor. Also, make sure your power supply is capable of giving the 2-5 amps current the circuit will take (this depends on the input voltage you'll be using, and the value of R2), or just use one or two motorcycle batteries... My initial test runs were performed with a 4A/h Lead acid battery... Cheap and reliable... Two would make an excellent high power supply for a higher powered version of this circuit, and should run for nearly one hour non stop. But again be aware that most smaller flybacks will *NOT* take more than 12V input without arcing over internally. For the first test, make a spark gap (this can be just two pieces of stripped wire) about 1mm in length, and apply power to the circuit. If you have a variable power supply I suggest you increase the power slowly and observe the current draw. If there is too much current being drawn (like a short), than the transistor is gone (this happens far more often than I wish it did). If there is too little current being drawn, than it is not oscillating (it should start oscillating at about 5V input) and you may need to reverse the leads on the feedback winding. It is recommended to use a push button type switch, so that operation stops when you release it: This is sometimes called a "Dead-man switch", and is a must in any sort of high power equipment, where a shock would make render the operator unable to cut off power... Sometimes the switch activates a relay... This is a good idea when very high currents need to be switched, but that is not the case here. If it all works out, you should see a thin purple arc between the two terminals on the spark gap. The arc will produce a faint hissing sound, which is associated with it's frequency. As you draw the arc the hissing will develop into a high-pitched whine, which will than increase in frequency until it becomes ultrasonic (20 000Khz+) and you can't hear it any more. At high powers, the arc can be drawn quite far... At 120W I could draw it over 3cm far at times, and at 180W it could reach out to 5cm (2"). The maximum length you can start an arc at is directly related to the output voltage. Although DC spark length vs. voltage tables don't transfer too well into high frequency systems, the 30kV max a very good flyback can produce will start an arc as far as 2cm... However, most likely you will see it starting at 1cm or so... As a rough guide, you can calculate the voltage by the distance the arc will start between two needle points: calculate roughly 1.1kV per mm. If it does not work, than the most probable cause of malfunction is the transistor. Check if it is drawing current. Short circuit current and very little current are both indications that it has been ruined (by over voltage or overheating, respectively). Another thing to check would be the flyback, and see if its secondary wasn't shorted (evidenced by localized heating after brief operation). Also note that the capacitive current transfer is quite dramatic at these high frequencies and voltages: Anything large and reasonably conductive will behave as a ground to this system... Loose bits of metal, table surfaces, carpet, and a human body will arc to the HV wire much like the ground wire does, producing rather undesirable effects (burned carpet, burned table, burned fingers, destroyed equipment... More on this below). The term "Insulator" also becomes relative... The HV will burn through a rubber glove like it wasn't there, and it will do the same to thin wire insulation... You should use nothing but real High Voltage wire, rated for 30kV or more. It should have two layers, the inner one a hard silicone plastic, and the outer one made of rubber. Double braided wire with a grounded outer layer also works, but tends to rob a lot of power from the system. Make sure the inner conductor is copper (car ignition wire is carbon, and therefore too resistive to be of any use here). Also mind the fact that any ground outside the wires will make them behave like a capacitor, coupling energy to the ground... This is rather obvious if you hold them in your hands: Your fingers quickly become warm! So make sure to keep them away from any potential discharge point. 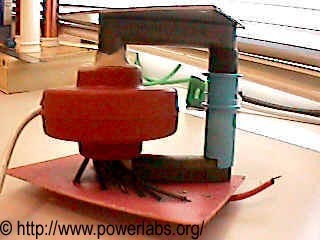 Below you can see some pictures of the flyback operating at maximum power (about 225Watts). The output voltage is close to 40kilovolts, which is enough to ionize the air without any ground nearby, as can be seen on the first picture. The electrode used is a needle. The corona extends up to 3cm into the air, and once struck the arc can be pulled up to little over 5cm. It hisses loudly and if held there for long enough, will melt the steel needle! Click on the pictures to download the video from which these frames were captured, or hover the mouse cursor over them to see an explanation. Also see the Ion Engine (729KB, .mpg) and the Voltage Multiplier (1.68MB, .mpg) videos! As with any other potentially hazardous device, you must accept the full consequences of your actions if you choose to build this system. Although the nominal output current is not lethal in itself (10mA at most, contrasted with the 35mA typically needed to fibrillate a human heart), and the high frequency causes nerve response to be minimal (much like the human ear cannot hear sounds of a very high frequency: Ultrasounds above 20 000Khz, human nerves do not respond to very high frequency electricity (above 1kHz the nerve response drops gradually), hence very little or no sensation of shock is felt, even as significant currents flow through your body), there are still dangers that you should be aware off, and I would not recommend a complete beginner or someone who has no previous experience whatsoever with high voltage to try this. At least not without supervision of someone who knows what he is doing. The arc itself is plasma, and has a temperature well into the tens of thousands of degrees. Although the low current makes it small and therefore not too destructive, it will easily set on fire any flammable materials. The dangers are not obvious: A flyback can set fire to a piece of wood just by sitting above it, and arcs may trail over insulators and burn them in the process. As far as the operator is concerned, an arc represents some dangers too: If touched, it will immediately burn the arcing points, with a noticeable smell of burned flesh and a black spot where the arc struck. Although the injury in itself is small, it can cause one to involuntarily jump or jerk away from the power source, and hurt himself against whatever is behind him (believe me, falling off your lab bench after touching a high voltage wire is *not* funny!). Finally, although the circuit in itself presents little danger besides the hazards normally associated with high voltages and electric arcs and sparks, if you use it to charge a high voltage capacitor it will become a real life threatening device. Even small capacitors are capable of discharging tens or hundreds of amperes, and will easily cause heart fibrillation, specially in people with previous (reported or not) heart conditions. Hence, the use of cascades to multiply output voltage, or capacitors for ionic experimentation is highly discouraged for beginners! This can be used to power Jacob's ladders, a small Tesla Coil, ion engines, and much, much more... With a cascade, very high outputs can be obtained. This video (1.68MB) shows it producing sparks as large as 15cm! (estimated 60kV+)But first, make sure to check my plasma globe page to see an awesome use for this device! Don't forget to send me some MAIL, and tell me what you think! People have visited this page since 30/01/00. Copyright ï¿½ 2000 - 2002 by Sam Barros. All rights reserved.